They’ve finally hit the road and we’ll see how it all unfolds this summer. AMC just announced that Preacher season two will premiere on June 19. It will see Jesse (Dominic Cooper), Tulip (recent Oscar nominee Ruth Negga), and Cassidy (Joseph Gilgun) on the road, looking for God, with the Saint of Killers on their tail. This is more or less how Garth Ennis and Steve Dillon’s original comic series, which ran from 1995-2000, begins, and it’s the setting that inspired executive producers Seth Rogen and Evan Goldberg to transform the books into a show. In addition to the series regulars (those that survived the first season, at least), season two will add actors Noah Taylor, Pip Torrens, Julie Ann Emery, Malcolm Barrett, Justin Prentice, and Ronald Guttman. Along with the premiere date, AMC released these photos from season two. Obviously, those images don’t reveal much. But it’s nice to see the gang back together. 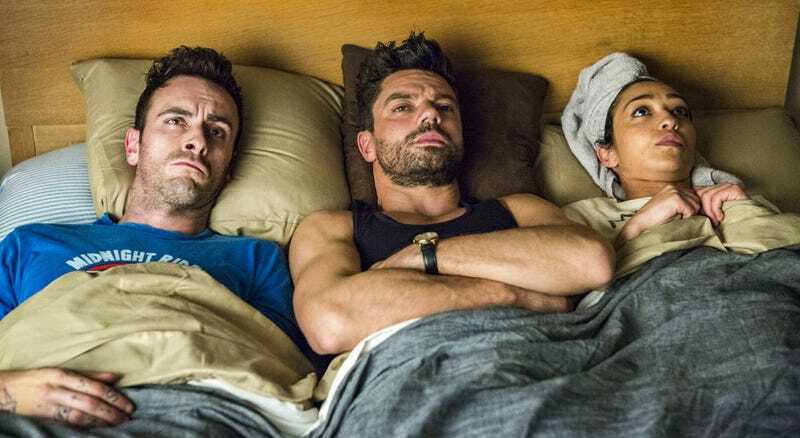 Preacher will have a panel at SXSW this weekend, so we may get more season two details then. Did Preacher Just Defeat the First Season&apos;s Villain?